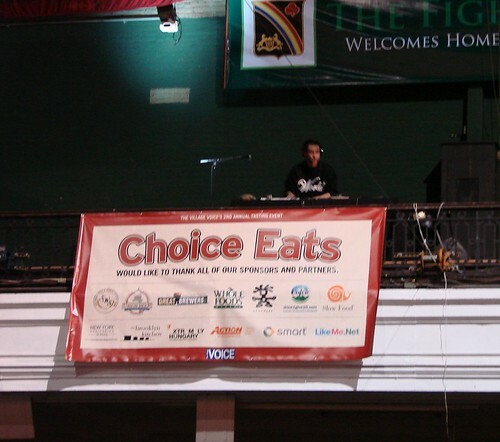 The Village Voice announced last week that the new additions to this year's Choice Eats line will include: DuMont, Patacon Pisao, El Almacen, Fatty Crab, Egg, Max, Madiba Restaurant, Luke's Lobster, Spicy Bampa aka Bamboo Pavilion, Rajbhog Sweets & Snacks, Ambiance Restaurant, Mercadito Restaurants, Pinche Taqueria, Smorgas Chef, The Vanderbilt, Baohaus, Mooncake Foods, and Hummus Place. Kuma Inn: Adobo & Atcharra: Pork Belly braised in soy, vinegar and garlic with pickled vegetables. Purple Yam: Tocino (sugar-achuete cured pork) sliders in purple yam rolls with grated green mango. Chicken/Pork adobo skewers. DuMont: Spring Chowder: cucumber-scented chowder with mussels, clams, and shrimp finished with an herb pistou. Mercadito: Tacos de Camaron: Shrimp, roasted garlic, chipotle mojo, and avocado. Ovelia Psistaria Bar: Kafteri: Spicy mashed feta spread, Ovelia Loukaniko: House made sausage, Skirt Steak in Greek coffe-based rub. For those of you unfamiliar with the event, each of the participating restaurants has been hand picked by Village Voice resident food critics, Robert Sietsema and Sarah DiGregorio. 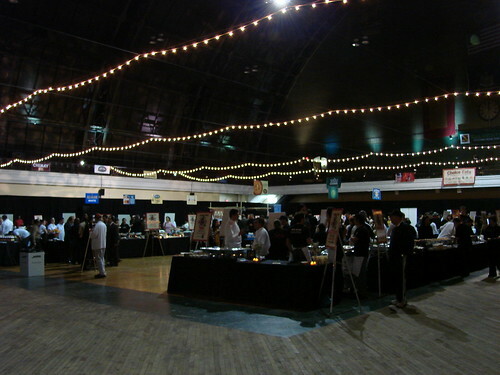 Over 50+ restaurants spanning food from over 35 nations will be represented on Monday, March 22, 2010 at the 69th Armory on Lexington Avenue in New York City. Complimentary beer, wine, and cocktails will be available (so, sorry no kids allowed). Agnanti Restaurant, Ambiance Restaurant, Baohaus, Dirt Candy, DuMont, Egg, El Almacen, Fatty Crab, Fette Sau, Fort Defiance, Hummus Place, Kuma Inn, Luke's Lobster, Madiba Restaurant, Mama's Food Shop, Mantao Chinese Sandwiches, Max, Mercadito Restaurants, Mooncake Foods, Mumbai Xpress, Mustang Thakali Kitchen, Ovelia, Patacon Pisao, Pinche Taqueria, Porchetta, Purple Yam, Radegast Hall & Biergarten, Rajbhog Sweets & Snacks, Smorgas Chef, Spicy Bampa aka Bamboo Pavilion, The Sheep Station, The Vanderbilt, Tiffin Wallah, Toloache, Txikito, Xie Xie and Zuzu Ramen. The early bird tickets already sold out and if last year is any indication, this event will sell out in advance. For a sneak peek of all the deliciousness that awaits check out our coverage and photos from last year's event.